Rare is it that a superstar of Madonna's caliber comes along. It almost seems as though there was just something to the '80s with the likes of Michael Jackson, Madonna and Whitney Houston making their way into our hearts, society and culture. Given that two of those three names above now require the term "late" as a predecessor to their names, we want to give a shout out to one of our favorite '80s superstars and watch her rock her waves through the decades. Madonna, with you, it always like the very first time. 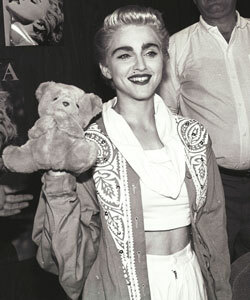 Madonna, here in Toronto on July 3, 1987, for a concert the next day, displays BJ the puppet, a gift from a fan, following a presentation of an award from WEA Records for selling over a million copies of her True Blue. Read More: Celebrity Curls: Carrie Bradshaw is Back! Pop star Madonna sings to a full house at Rotterdam's Fayanoord Stadium July 24, 1990. 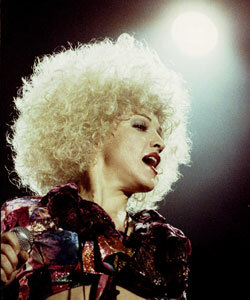 Madonna was currently on a major concert tour of Europe. A spot light beams over pop star Madonna who gave a concert to nearly 40,000 fans at Istanbul's Inonu stadium October 7, as part of her world tour "The Girlie Show." 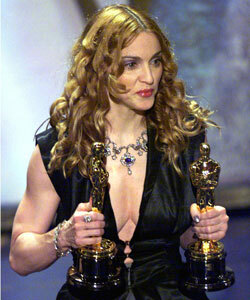 Madonna holds two Oscars as she presents the award for Best Song to James Horner and Will Jennings for the song "My Heart Will Go On" from the movie "Titanic" at the Oscars, March 23. Madonna performs at the MEN arena in Manchester at the start of her European tour, August 14, 2004. Singer Madonna arrives for the Vanity Fair Oscar Party at Mortons in West Hollywood February 25, 2007. 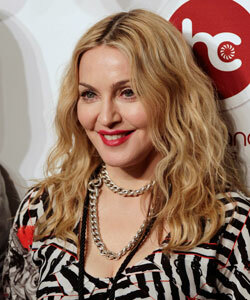 U.S. singer Madonna arrives to open Hard Candy Fitness gym in Mexico City, November 29, 2010. U.S. pop star and director Madonna arrives on the "W.E" red carpet at the 68th Venice Film Festival in Venice.